Every single bachelor likes getting high and being stoned which is being the perfect dream back in college days. Best thing of Marijuana is it’s something different from Booze and alcohols which don’t give you Kick what the marijuana used to give. “Dope a day Keeps Doctor away”. Before reading this Article I want to make clear this article does not support marijuana or any topic related to it. I’m not responsible if you or your friends ever get influenced for trying such things out and I am against it. This article is just for knowledge purpose. Marijuana plant is the raw material for the production of many new medicines and research to cure disease. Our Vedas called it as a source of happiness, liberator, joy-giver that was given to humans with a positive approach to help them attain delight and lose fear, anxiety and nervousness. Lord Shiva was frustrated due the very hot heat and the recent fight with his family, he passed out under a leafy plant. Hours later when he woke up, his hunger and curiosity led him to sample the leaves of the plant. 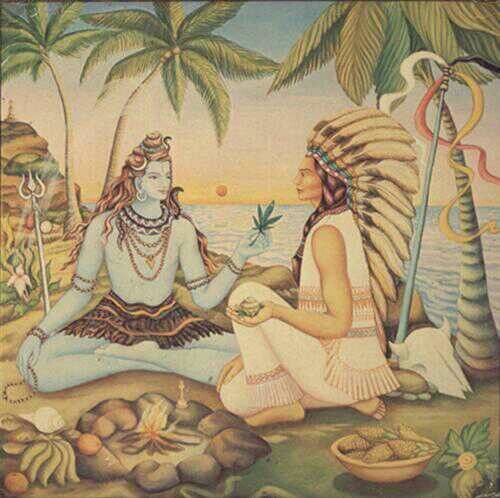 Lord Shiva was Re-energized by the effects of the cannabis plant. And he became so high and stoned that he made it as his favorite food. According to The Vedas, Marijuana having numerous medical benefits was one of five sacred plants. Given that studies across the world show that moderate consumption of marijuana is far less harmful than tobacco or alcohol, it makes little sense to uphold the ban on its recreational use. Unfortunately due to western pressure/influence in India Marijuana is banned. Aghoris are yogis and Shiva is the ultimate yogi. Marijuana helps them concentrate on the strenuous yogic practices. Lord Shiva is a Vaishnava and according to Vaishnava principles one should not smoke weed.But Lord Shiva is so powerful that he can drink the whole ocean of poison without getting harmed. Similarly, he can smoke Marijuana without losing his stature of Vaishnava. He is the one who is shown making mistakes and then learning from them.He is shown as dancing with a free mind.There is a reason for why he is called BHOLENATH. Bhang essentially, is an Indian beverage prepared by blending cannabis with different herbs and spices. According to the Atharva Veda – the fourth book of the Vedas, ‘bhang’is one of the ‘five kingdoms of herbs, which relieves anxiety’. Thus, it is said to have medicinal properties. It is offered as a gift to Shiva by devotees, especially during the Shivaratri festival. This can be seen at the temples of Benares, Baidyanath, Tarakeswar & Pashupatinath. After the ritual & ceremony it is also consumed as Prasad by devotees & yogis. Consuming it in reasonable proportions is believed to cleanse sins, unite the soul with god & avoid the torments of hell in the afterlife. However, excessive consumption, without adherence to rituals, is viewed as sinful. Their medicinal value is said to assist in Sadhana or meditative practice, by enabling the yogis to overcome the miseries of the body & enter a state of trance. In the extreme climatic conditions of the mountainous regions, marijuana products help calm the nerves, in the biting cold. One can thus conclusively say that Shiva does consume Marijuana in various forms, however, he does so purely to weather the climatic extremities of the mountains & to assist in his spiritual advancement. Again I’m saying we are not responsible if you or your friends ever get influenced for trying such things out. This article is just for knowledge purpose. Always be happy and pray lord shiva he will fulfill all your dreams and wishes.